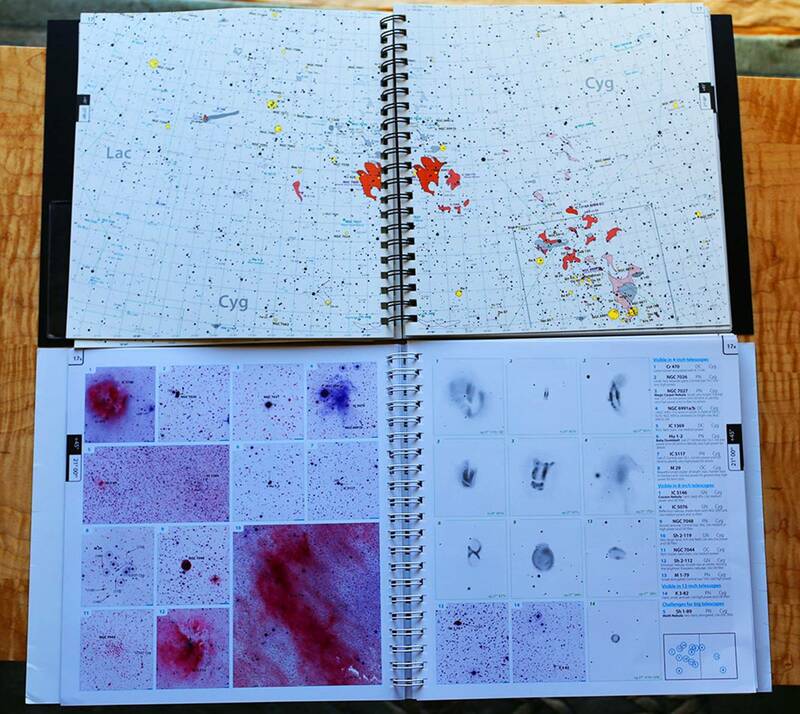 I’ve long preferred to have images—and/or drawings--of deep sky objects near my atlas, observing list, and, of course, my telescope. David J. Eicher’s The Universe from Your Backyard (1988) was an early, well-loved companion of mine, as was Burnham’s Celestial Handbook. So was the self-published 1994 John C. Vickers’ Deep Space CCD Atlas: North (and South). Vickers’ CCD atlases are images only, and rather primitive ones by today’s standards; but the atlases were not meant to be a compilation of ‘pretty pictures’; but rather a source of black and white images of interesting deep-sky objects that amateurs might want to hunt down with their warm, moist eyes, or sub-ambient-temperature imaging equipment. 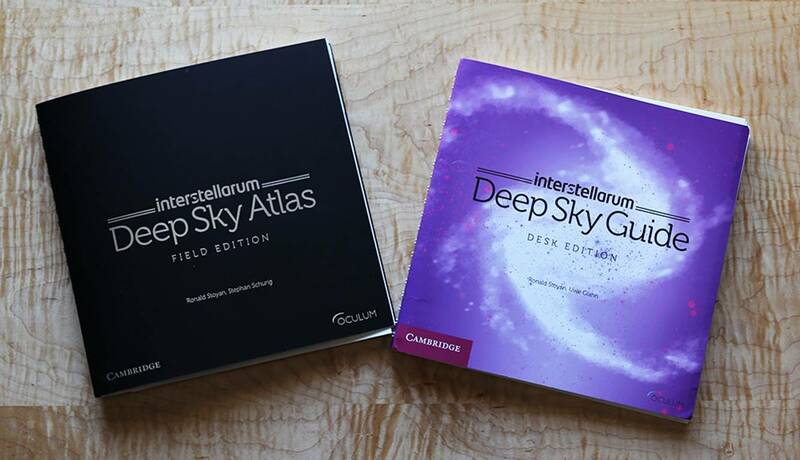 You can find excellent reviews elsewhere of the interstellarum Deep Sky Atlas which has replacedmy Star Atlas 2000, Uranometria’s, other dead-tree resources, and maybe even printed star fields from my preferred software: MegaStar. . .Good thing I already had this pricey (~$200) Atlas because this Guide (~$100) is meant to be used with it. Like all things excellent, this is intuitive to use: Open your spiral-bound Atlas to a page of your liking; Now open the Guide to the same page. 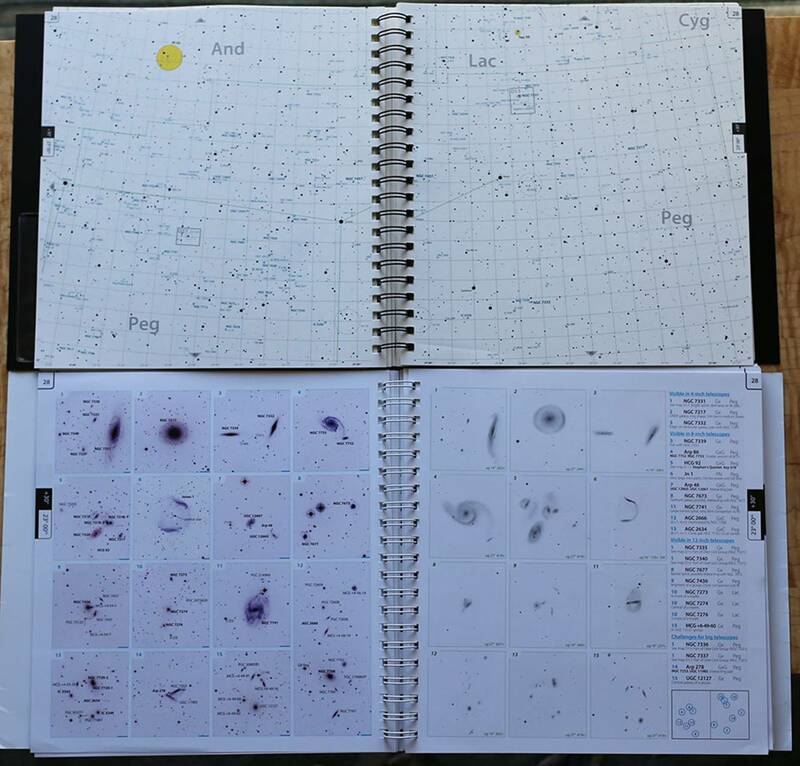 Instead of star fields, constellation lines, plotted deep-sky objects (like in the Atlas), you will find selected DSS images of interesting deep sky objects on the left page, and drawings on the right side of many of the imaged targets. (Sometimes there are too many interesting DS objects for one page; in that case, you simply turn from page “a” to page “b”). 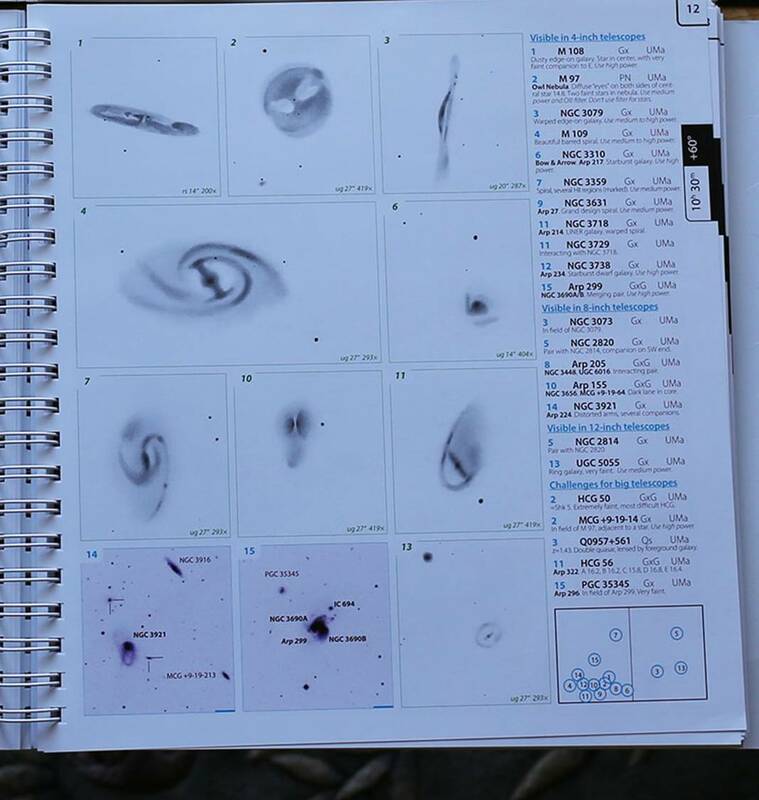 Like the Atlas, the Guide tries to sort the DS objects into what is visible in 4, 8, and 12-inch scopes, with another category of “Challenges for Big Telescopes.” This is the right-hand column . . . I might quibble that Jones 1, a planetary in Pegasus is visible in an 8-inch scope, but hey, the smallest aperture I’ve tried with this favorite of mine is 12 inches. Besides, deep-sky observers have friendly banter all the time what the minimum aperture is needed to see some faint fuzzy: Nothing new here! Also: At the bottom of this right-hand column is a very useful graphical representation of where on the Atlas these objects are found. These are numbered per page. Very clear; very intuitive. By the way, the authors (Ronald Stoyan, Uwe Glahn) do not claim to have included a comprehensive list of everything ‘up there’: This list is a discriminatory one (some bright, well-known objects are ignored), and I love that (call me a deep-sky snob)! Regardless, a cursory look at the index (too small of print here; my only gripe so far), shows that all Arps and Hickson Compact Galaxy Clusters, for example, are plotted and imaged, even the impossible Hickson 50. I also found a particular nemesis of mine: Planetary Abell 74 imaged and drawn (p. 29a). The drawings are, of course by the authors, they use a range of Newtonians (Dobs) from 14-27 inches in aperture. How many objects are imaged and drawn? 1729 bi-color POSS composite images; 821 drawings! Of the “bi-color POSS composite images”: I’m thinking the predominately red ones will disappear under an astronomers’ red light? Still, a useful gauge (while preparing, at home, that is) to determine which filter to consider using at the eyepiece, or imaging equipment. This is the “Desk Edition,” and, as far as I know, the only one available right now. I do have the “Field Edition” of the Atlas, and though I have not tested either under extreme dew-like conditions, I cannot feel any difference in the quality or thickness of the paper used: Very high quality, as far as I can tell. In fact, I have only had this Guide a few days, and have yet to use it under dark skies, but am itching to do so! I recently purchased the field edition of the Deep Sky Guide on Amazon.de for just over $100. You don’t need to know German; there’s an English version of the website. Just wanted to mention this in case anyone else might be interested. nice review, looks like the field atlas you have is no longer in print as of Jan 2019....wonder if new version works the same with the guide? Amazon seems to still be carrying both the Field Atlas and the Guide, at least with my "prime" account. A number of other AMZ 'partners' carry it new or used, too. But, yes, on the publisher's page--Cambridge--it does say the Field Atlas is out of print as of January, 2019. . . Hopefully this is just a temporary glitch? The website is able to be viewed in English, but the Field Guide offered there is in German. Not sure why you keep pointing this out. As mentioned in the article, I bought the "field edition" off Amazon (US) for about $100, too. In English. Say what you will but for smaller scopes like a 8" through 12", you will never beat the Sky & Telescope's "Pocket Sky Atlas - Jumbo Edition or again the Sky & Telescope's Deep-Sky Wonders by Sue Smith. I am 75 and been an amature astronomer since I was in my teens. Those two books are the absolute best and to me all you will ever need. Michael Beck. Alabama. You should write a more detailed review of these, Michael! BTW: Your age and experience are not great rational 'arguments' for your cause (I'm not far behind you in either): They are anecdotal. . . Think of it this way: How many fathers of many, many years of experience are still bad dads? Even with good kids? Also, it's: amateur, not amature. Michael is right about the Pocket Sky Atlas Jumbo Edition. For the money, it can't beat. A lifetime worth of viewing for under $30. Wonderful.